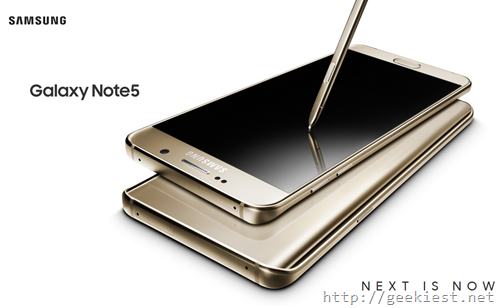 Samsung announced the Samsung Galaxy Note 5 in India today. The phone will be available from September 20, 2015. The price of Note 5 will be INR 53,900 for the 32Gb model and INR59,900 for the 64Gb model (It does not have SD card support). It will be available in Black, Gold and Silver colors. The device will have the S pen as the previous versions. S pen will have a push button release option like previous Notes. It will be having Exynos 7420 chipset, Quad-core 1.5 GHz Cortex-A53 & Quad-core 2.1 GHz Cortex-A57 CPU and Mali-T760MP8 GPU with 4GB of RAM. Primary camera will be a 16 Mega Pixel auto focus camera with LED flash while the secondary camera will be a 5MP one with 120 degree wide selfy angle. It comes with Android 5.1.1 out of the box and a Non-removable Li-Po 3000 mAh battery. This device supports wireless charging and Samsung claims you can charge your phone to the full with just 120 minutes using the the wireless charger and even faster when you use wired chargers.